Termagants, five of them all from my ebay goodies bag, what do these cost now at GW £6 [going up to £6.60 I think] and the bits bag was just over £4 and it also got me the two Hive Guard and four Ymgarl Stealers. One day I'll work out the true value of that perfect little treasure. And the 10 Devgaunts complete with their Toxin Sacs, as I say more for unit identification than actual upgrades and if anyone ever raises that as a beef I'd rather not play. These will come in useful if I ever do a double drop pod Devgaunt-wing [ha, ha]. 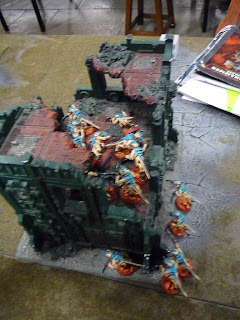 My son used these at Warhammer World. I'm still not sure about how his battles went down. I know he lost all three matches but he hasn't been particularly infomrative about who did what and how. Sorry about all the pics but I do love the colours on these and once they're varnished [indeed Maelstrom finally delivered although I did receive another confirmation email prior to felivery of despatch which makes me wonder if the first despatch notice was in fact erroneous] I may even use these in preference of the existing 10 Devgaunts. And a close-up, aren't they 'purty'? 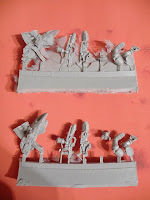 'nids part 42 - Tyranid Warrior to Hive Guard conversion pt4. BOOM! Here come the Hive Guard. I'm really chuffed how these turned out. They ended up costing so little from the bits that came in my ebay mixed bag. 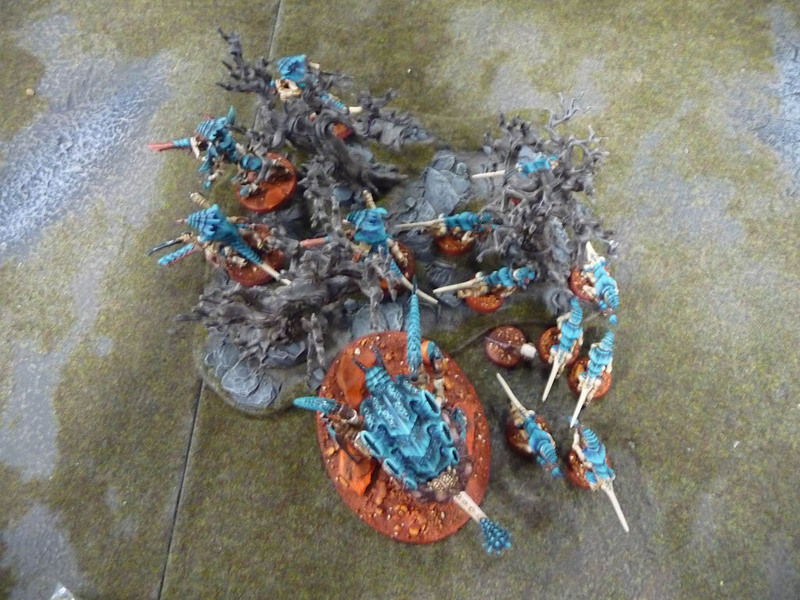 I've bought another 5 Warriors to make at least 2 more and needed to buy a further £5 worth of 2 pairs of rending claws and 2 Stranglethorn cannons but I still think I was quids in with my purchases. They make a nice pair, and are significantly different in pose to each other, something the GW model can't claim. Here, you can begin to see the 'arm transplant' and the extra armour plates from version 2.0 that were added to version 1.0. A couple of close-up shots to see the arm transplant. 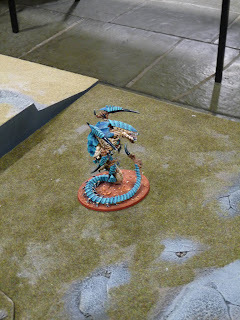 The back view of the Tyranid Warrior to Hive Guard conversions. Still as much as I like the actual model at £16 a pop that was never going to happen and the very fact I made the model and it resembles the original so well I think I'm happier to have this than any expensive 'kosher' representation. Anyway here's a proper side view to see the difference, of course if I'd put the Hive Guard in front you'd have also seen the Warriors long tail too. Still I think there's no mistaking these are very different models. 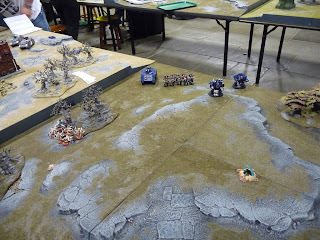 Here's the first game of the 'Let There be War' Tournament at Warhammer World. This was four of the local GW's in two teams - the 'Seasiders' (Southport and Blackpool stores) Vs the 'Inlanders' (Liverpool and Preston stores). 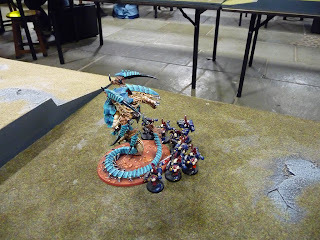 Both my Son and I were obviously on the Southport side of the 'Seasiders' both with a 1000 pts of 'Nids. 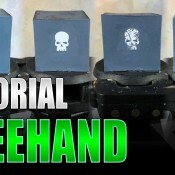 The three games would utilise all three mission objectives and deployments. 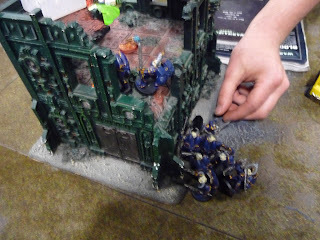 First match for me was a guy called Mark with his Night Lords [counts as Blood Angels]. 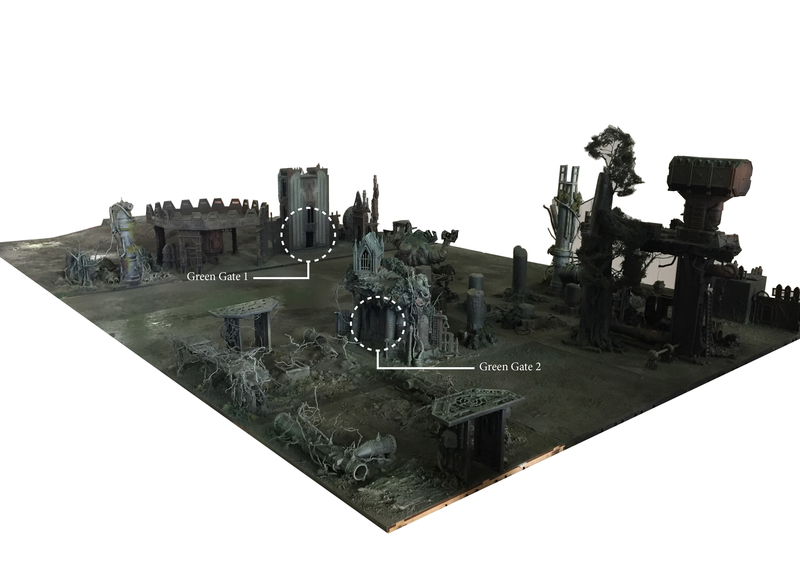 Spearhead deployment with five objectives - one just on the upper side of the petrified forest were the Stealers infiltrated, another behind them. One in the centre of the board on the hill. 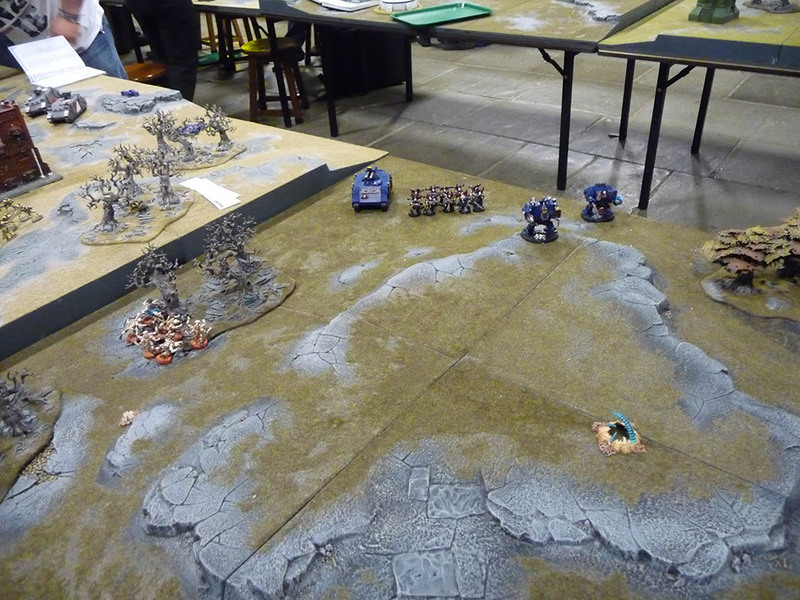 He had a squad in the Razorback, a normal Dreadnought, a Librarian Dreadnought and the unit alongside the Razorback with an Assault Squad in reserve. My deployment had the spore mine objective secured below the forest and the Hormagaunts heading for the building which contained and objective on the second floor. The Hormagaunts got a decent run and captured the building objective. 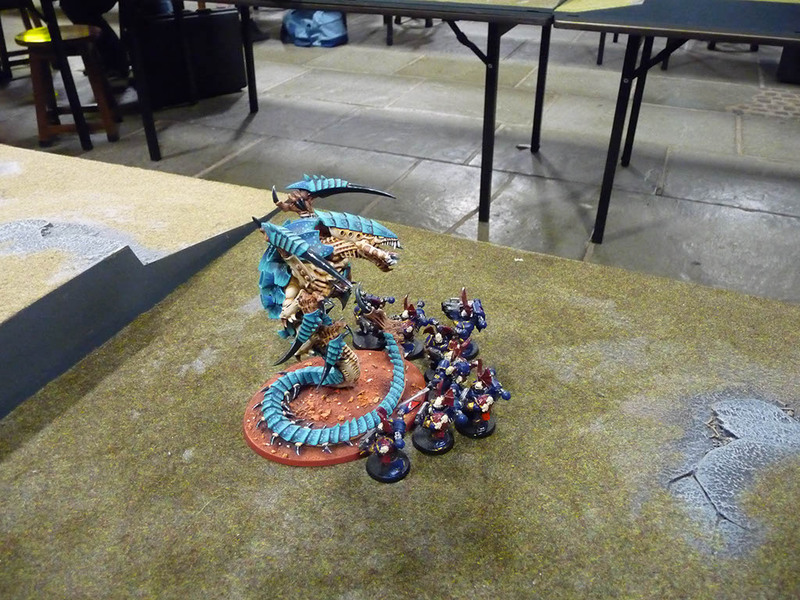 I'm not sure who got first turn but I know the Tervigon spawned 8 and got doubles so not more Termagant troops for me. The Tyranid Warriors received a lot of attention from the Razorback and Dreadnoughts. Unfortunately I wasn't able to try some wound allocation shenanigans to try and keep the unit alive as Mark didn't seem familiar with using the Primes higher toughness to take one wound from the Las-cannons instead of Instant Deathing a whole Warrior. I wasn't going to be an a$$ about it so we carried on and the unit slowly whittled down. Turn 2 and the Trygon deepstruck and deviated, he's so unreliable. Mark was very generous in that he said he was just on the board, which was nice and karma rewarded him later. He shot with his Bio-Electric pulse and killed two of the Marines. In hindsight I'm not so sure I should have put him here he may have been better in the centre of the board. 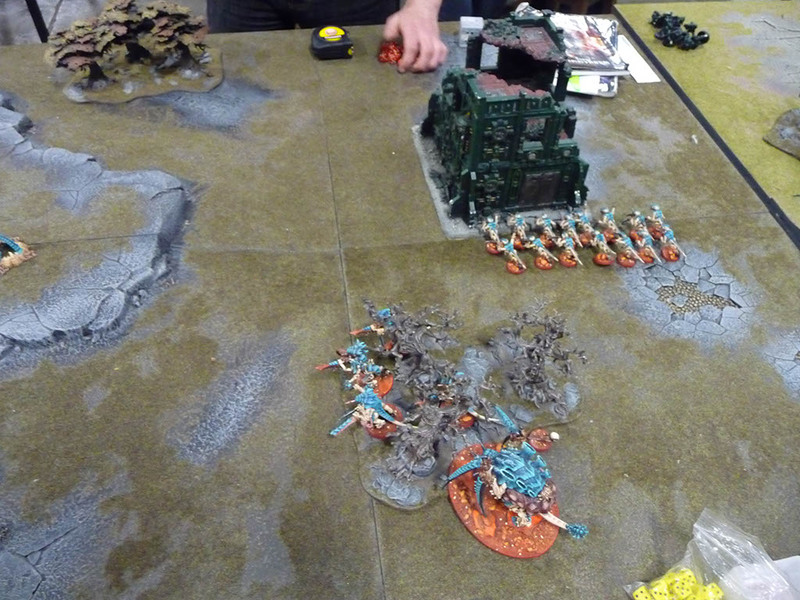 Anyway, his Assault Squad deepstruck and he too deviated. 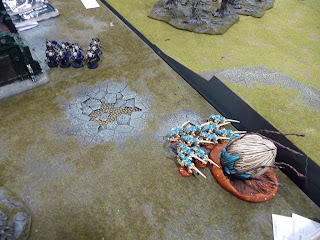 I think the scatter dice should have had them a little closer to the board edge but even if they'd have been two feet onto the next board I'd have let him have them land safely considering his generosity with the Trygon. it killed a fair few, enough to cause a Leadership check which they failed and chased them down and ate the lot. That was a pretty awesome result but the consolidation didn't take me very far in my attempt to tackle the Razorback. 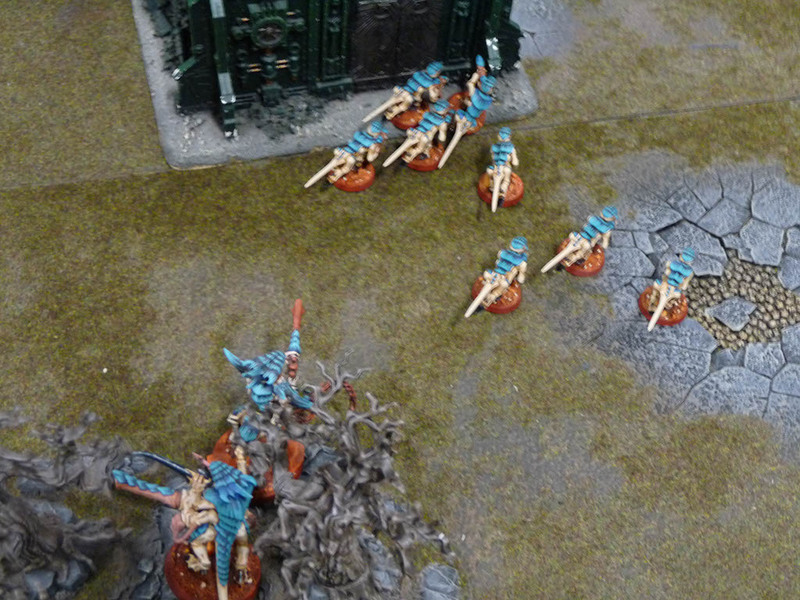 The Termagants failed to do any damage to the Assault squad, neither did the Prime. 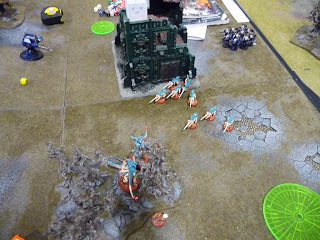 Meanwhile over on the left flank the Stealers had taken some casualties but had spread out to capture the forward objective and take cover. 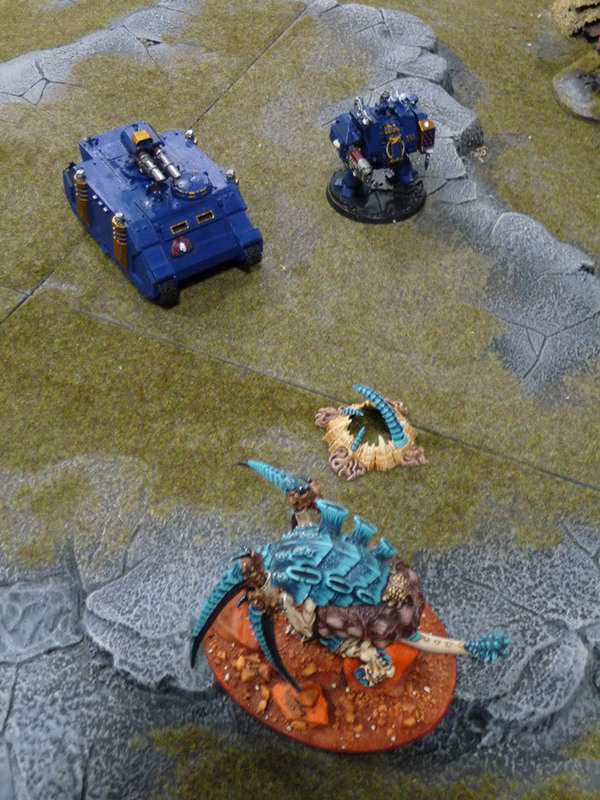 Having spawned out the Tervigon did what I thought was the sensible thing and went for the Razorback and also the central objective. 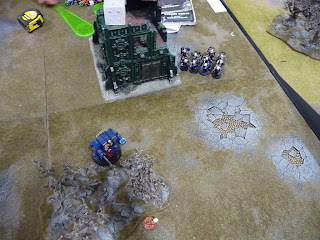 As you can see the Plasma/Missile Dread was pretty much slaughtering Hormagaunts and Warriors with abandon thanks to his central location and hilltop vantage point. The Librarian Dread had all sorts of psychic advantages that managed to whip it about the field I think. So he slaughtered the Warrior and Prime, they weren't even strong enough to do any damage to its ceramite hide. 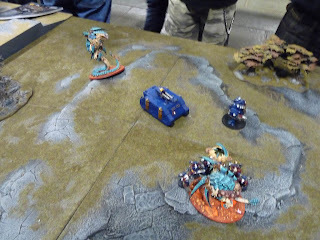 The Termagants and Hormagaunts were roasted by hand flamers and shooting from the Plasma/Missile Dread. Here come the reinforcements. Again deviation and again Mark was quite generous. I'd hoped to get them back here to shoot the Assault Squad down and recapture the building objective. Again this was a bit of a mistake. The Razorback disgorged it's troops and targetted the Tervigon who received a number of wounds. The Assault Squad then charged in and I think slaughtered it. Over on the right the other Assault Squad made it into the building and captured the objective the Devgaunts may have been whittled down to nothing and over on the left the Stealers conga lined to try and capture the two objective but Mark was adamant that they could not reach both objectives. So the end result was a LOSS as he had two objectives to my one. In conclusion I think I snatched defeat from the jaws of victory here. I overstretched myself. 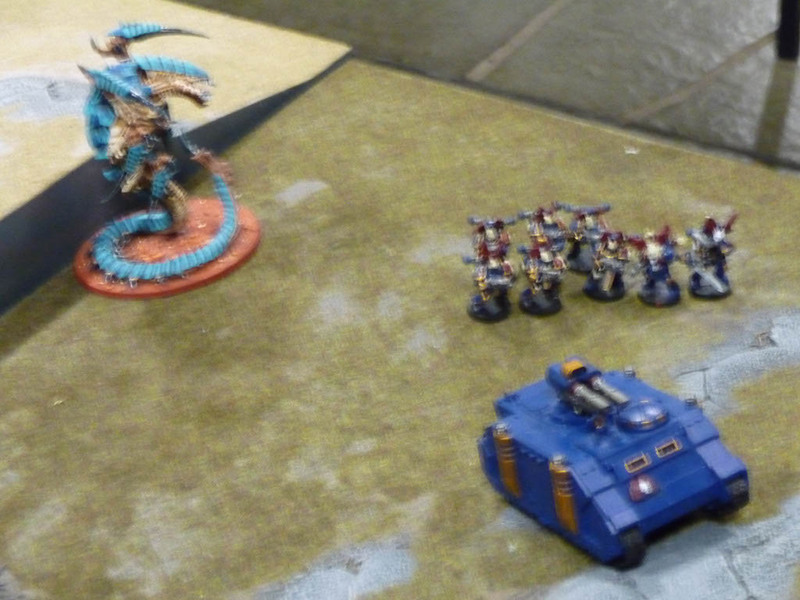 Perhaps if the Trygon had come in on the center objective it could have cleared the Plasma/Missile Dread or the Razorback allowing the Tervigon space to capture. 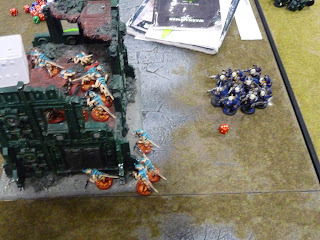 But then perhaps the Tactical squad it ate would have had free reign to go for the Stealer's objective. 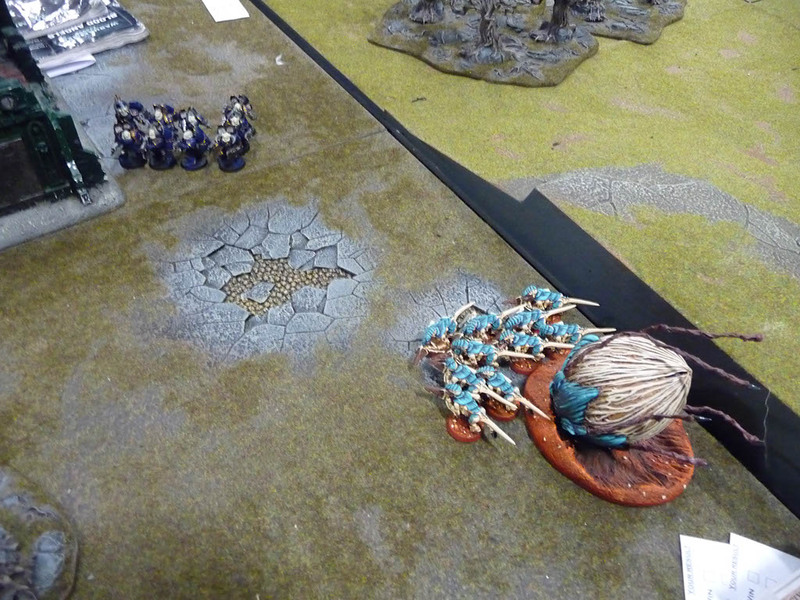 Definitely if I'd put the Spore Pod down to capture the other objective on the left I could have saved a draw at least but at the time I thought the Stealers could have got both. Either way I think I should have done better, objective scoring is this lists forté and I blew it by trying to capture all of the objectives instead sticking to two or three at the most. So you know 6th Edition became available for pre-order today and you know I was told there was a limited edition set? which I mistook for box set. Well, they obviously meant the Gamers Edition in the leather satchel and the Collectors edition [only 4000 worldwide] which is neither the box set I was hoping for. 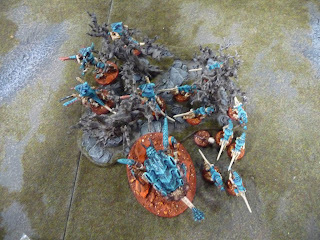 So I went into my local GW anyway, there were free bacon butties afterall and I thought we could paint for an hour and then scuttle back home. On entering the Store Manager immediately asked me which version I wanted and when I said I was waiting for the box set he said 'what? until September?' Indeed, September is a long way away. Still I sat down and painted for a bit but I kept tuning in and out of the conversations around me. Of course sitting around painting amongst a quite excited crowd giddy about something no one could actually see or touch is very odd, however the new White Dwarf seemed to be sufficient to fire the imaginations of all those present. It was then I changed my mind. I realised that the swanky gamers edition in the satchel might be a nice little investment - I could buy it, enjoy it until September, then sell it on ebay and maybe even turn a little profit. Sorry if the mercenary capitalist ideals offends anyone but it's only business and it's not like I can't use it as a whole new source of things to share with folk on the blog. So I started chatting with the manager and he pointed out that if I was really in the market to invest, the Collectors Edition was the one to go for as with only 4,000 worldwide, compared with the 'limited edition' satchel, it was more likely to appreciate in value... At that point Rob, the chairman of my friendly neighbourhood gaming club popped in, also hoping to get a glance at the new rules. We chatted for a bit, he asked me if I was going to the club tomorrow as they have an Armageddon battle going on. Then I was left to decide and ended up going for the collectors edition. I doubt I'll regret this, Space Hulk was a limited release of 10,000 units and is now selling for double the retail price but I just hope I can part with it come the time. The money's not ideal either, what with the wife's Birthday next month, tickets for Throne of Skulls and my road tax due [does that mean my MOT too? bugger!] Still, maybe this investment will result in recouping some of those costs, fingers crossed. 'nids part 41 - Tyranid Warrior to Hive Guard conversion pt3. Previously on my 2nd Hive Guard conversion I was short a right rending claw arm. Once again I'm left a little lost as I kit-bashed a replacement together but now I look at it I'm not entirely sure what the components were. I think the arm was perhaps a left arm or at a very different pose as I had to split the arm at the elbow to repose the forearm in that grasping position. Whatever hand was at the end was removed and replaced with a Genestealer Rending claw left hand. A fraction too small and a digit short I had to cut the thumb claw off a Warrior Scything Talon to get the full four fingers. I can't quite recall what was attached to that 'stirrup' on it's forearm but I put a small ammo tube from a Spinefist in there [cos those Spinefists are seriously useful *sarcasm*]. I figures that whatever discrepancies between the left and right hands wouldn't be too noticeable because there'll be a ruddy great Impaler Cannon on top of it to get your attention, not some shonky arm transplant. Here's the second Impaler Cannon good to go. I'm not sur ewhy I took a picture of the first Hive Guard here, I think it's because I've done all the Bonewhite highlights, a small update but an important one. I've got the original instructions to create a Spartan out of an original Land Raider and Rhino model but if you're aching to transport 25 marines in one metal box then pre-order the new model from Forgeworld now - £95. 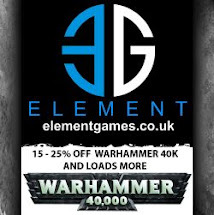 Warhammer World - What I bought - Forgeworld! 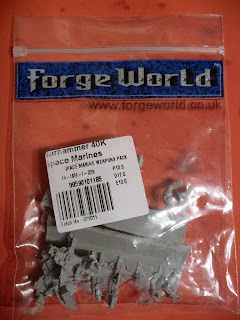 As I try and collate the many pictures from my visit to Warhammer World I thought I'd start with what I bought. 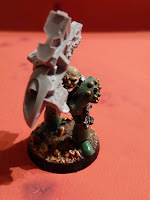 To be honest I had no desire to buy anything but seeing as my son bought himself a set of Dire Avengers I may have got carried away with the fun I was having and treasures around me and ticked off at least one of the Top Ten Things to do at Warhammer World. 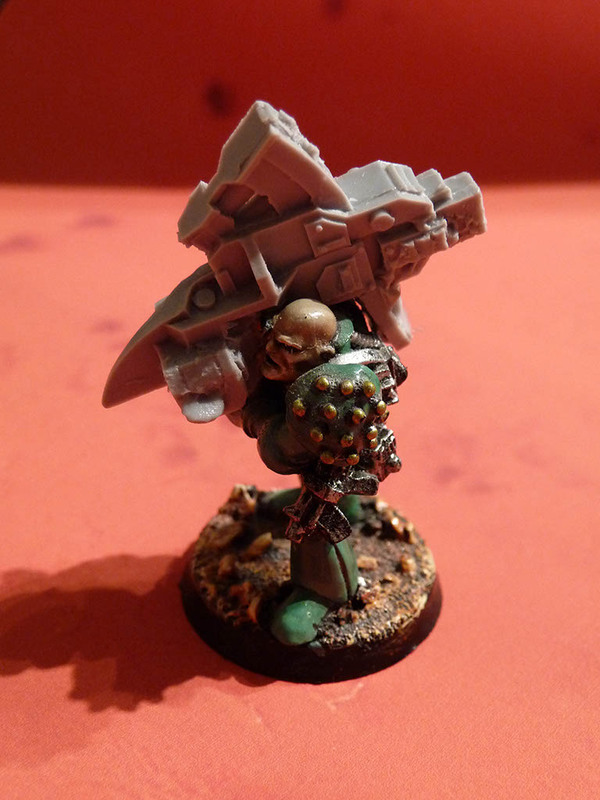 I went and got the Forgeworld original Space Marine Weapons pack. It's been something I've been eyeing for a while but hadn't bought it for a number of reasons. I needed the missile launcher for my Devastator Squad and I also needed a Meltagun and a Flamer for my Ravenwing so this ticked all the boxes really. There's obviously a lot of cleaning up to do there's more resin from the casting process to remove than makes up the bits! Still, fun times ahead. I'd looked at the alternatives but I don't like the 2nd Edition 'pipe' missile launchers that are relatively cheap and available. The current model is better but would be a devil to fit the Devastators. 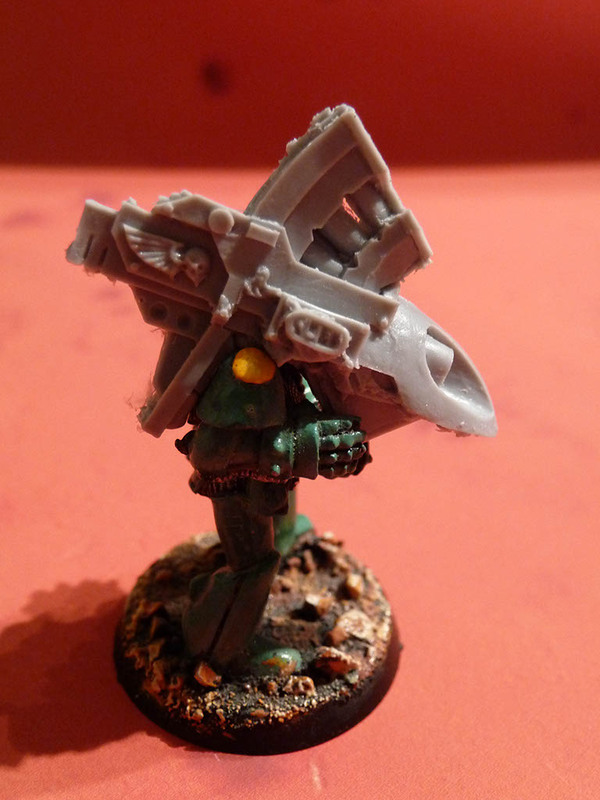 As you can see below this classic design fits the Marine much better. Lets catch up with the Diving Eagles. 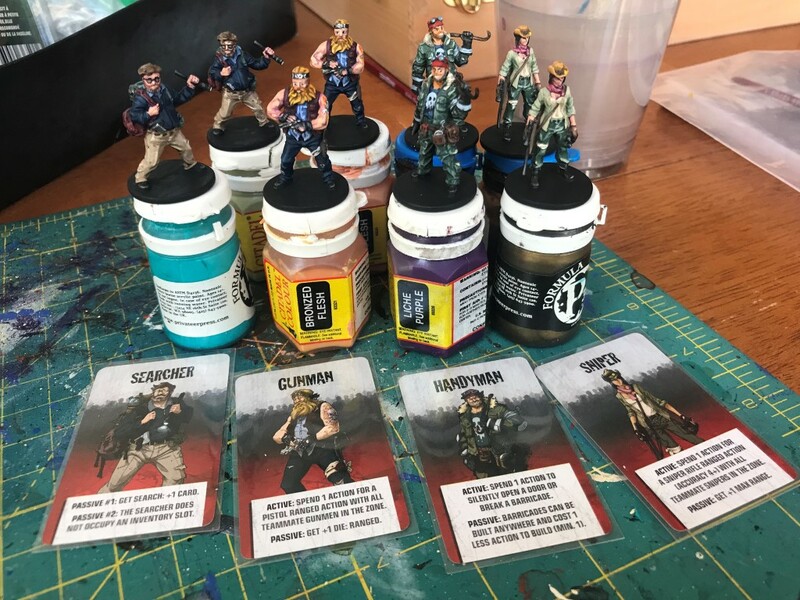 We left them with my test mini and the remaining 5 ready to be painted with highlights after all the washes had been applied by my son So, with this in his hand he went on and painted the remaining 5 miniatures and I was so impressed with the end results. Once again this is my test mini, this time in real sunlight so you can see that although the red oxide primer was tned down a bit by the washes it still adds a bit of contrast between the bodysuit and the armored plates. My son added the blue gem, I hoped he would spend some time on all the gemstones on his Eldar. A bit of fine detail on these spots would definitely lift all of his figures. It would be an interesting learning exercise in highlighting and the end result wouldbe greater than the effort involved, sadly I don't think he wants to do anymore to them, but he can always come back to address this if need be. Here's the complete set, including his five painted miniatures. As you can see there isn't a huge difference between my test mini and his efforts. You should be able to see this more clearly when comparing mine on the left to his attempt on the right. Even his blue helmet lenses are quite neat. I'd dearly love for him to add a bit of shading, a highlight and a white spot on these jems and even on the lasguns, maybe some OSL effects on the coils there and even do the five gems on the guns muzzle. As I say I hope he comes back to them at some point. They make quite an imposing squad overall. And his Exach is particularly cool too. These are definitely better painted miniatures than I was doing at his age so I'm over the moon. I hope he uses this as a benchmark for what he can do. I could be right I could be wrong?